About two million people in over a thousand cities and towns have joined demonstrations and marches across Russia on May Day. Moscow authorities have authorised 16 large-scale demonstrations, rallies and marches, joined by over 100,000 people. Communists, socialists, liberal-democrats, right-wingers and left-wingers, as well as labour unions have all held public events in downtown Moscow. The largest rally was held by All-Russian People’s Front and the Moscow Association of Labour Unions supported by the United Russia party. It attracted over 90.000 people, while Moscow authorities have authorised 60,000. Last year Russian President Vladimir Putin and prime minister Dmitry Medvedev also joined the rally and headed the column. 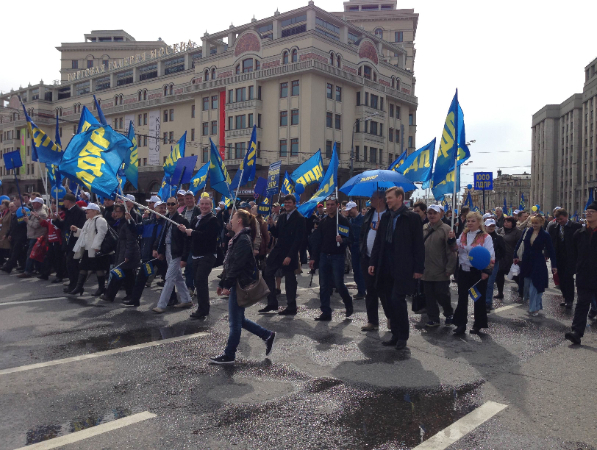 Participants were demanding better working conditions, higher salaries and highlighted the need for “Russian unity”. Russia’s liberal-democratic party (LDPR) led a huge rally towards the Karl Marx monument in Moscow. “We are rallying here to support LDPR, to support the freedom of speech. We will teach, we will help, we will lead,” Oksana, one of the rally coordinators told The BRICS Post. 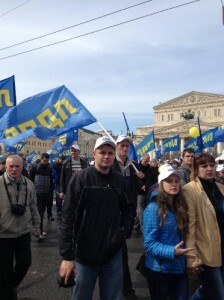 The opposition has focused on an anniversary rally that will be held on May 6 on Bolotnaya square. Traffic in most parts of Moscow had either been blocked or restricted, and over 10,000 policemen were ensuring security in the capital.